Thai Tribal Crafts is a Fair Trade Organization advocating and promoting Fair Trade to improve the livelihood of tribal people in Northern Thailand. They operate under the principle of fair trade: the main goal is to pay the producers the highest price possible and sell the products at a price that is just adequate to meet expenses. Any financial gain realized beyond the basic needs goes back to the tribal people in the form of benefits. Their trade is based on equality and fairness. Traditionally the tribal people have supported their families by engaging in slash and burn agriculture, which required them to move their village every few years in search of new fields when old ones lost their fertility. It is now no longer possible for them to continue this semi-nomadic lifestyle, as there are no new places to move on to. Mainly for ecological reasons the Thai Government now prohibits the felling of trees and clearing of hillside land. Thus, the tribal people are finding that they have less and land on which to support their families. The production and sale of handicrafts is an obvious answer to their problem, and one which does not destroy the traditions of tribal community life. In fact, handicraft production helps to restore and revive these traditions which otherwise might have been forgotten. Akha Tribe - The somber blue-black traditional clothing and crafts is brightened with embroidery, applique, seeds, silver ornaments, coins and shells. Karen Tribe - Karen women are noted for their ikat (tie-dye) weaving, using cotton thread and natural dyes. 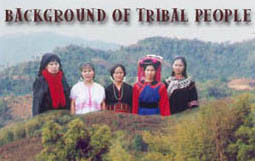 Lahu Tribe - Lahu women are skilled in weaving cloth both on the back strap and foot readle looms. Lahu weaving is unique in that the pattern appears on only one side of the cloth. Lahu women also produce delicate and colourful patchwork items. Lisu Tribe - The Lisu of northern Thailand make their clothing and crafts from coloured cloth stitched into outfits trimmed with row upon row of multicoloured stripes of cloth, applique patchwork, tassels, and beadwork.